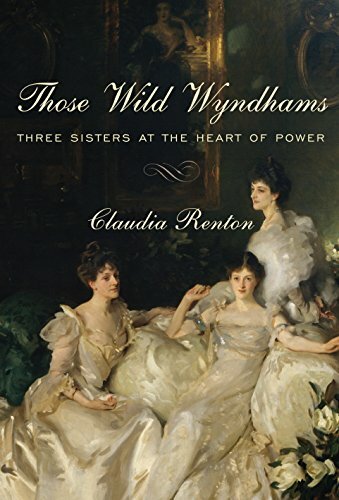 In Those Wild Wyndhams, Claudia Renton’s revision of her 2014 book by the same name, is an overpowering look at life in the Victorian and Edwardian eras. The Wyndham dynasty of Percy and Madeline Wyndham captures the inner workings of society at the end of the 19th and beginning of the 20th centuries with stunning clarity. Although the Wyndham children numbered five, with three daughters and two sons, Reston’s focus is on the daughters, and the sway they held over their family, acquaintances, and often over government itself. Reston holds court first with Mary, the firstborn child and oldest daughter. Mary holds society in the palm of her hands throughout her life. She often does not follow the rules of Victorian Society, and she does not care what others think or say of her. Mary’s marriage to Hugo Elcho was an exceptional match in many ways, not the least of which was his infidelity, her acceptance of the same, and her own affairs—one resulting in the birth of a daughter accepted as an Elcho, even though she was biological only on her mother’s part. Her ongoing romance with Arthur Balfour was a known situation that seemed to have caused no one any grief, even in Victorian England. The second daughter, Madeline (Mananai) seems to get shorter shrift in the book. One can only wonder if it is due to the fact that her marriage to Charles Adeane was solid and unsullied, unlike those of her sisters. The youngest child and third daughter, Pamela, known to family and friends as “The Babe,” “With her delicate features and refined air, she was considered the most beautiful of the sisters . . .” Pamela married Edward (Eddy) Tennant then after his death she married Edward Grey. Her heart, however, belonged to Harry Cust, a scurrilous cur, unsuitable in her parents’ estimation. Although Pamela went to great lengths to spend time with Harry, the romance was cut off. Cust was known to have had affairs with numerous women and fathered several children out of wedlock. Pamela seems to have not easily gotten over her love for the man, regardless of his reckless nature. An interesting side note, his granddaughter, Margaret, grew up to be Prime Minister Margaret Thatcher. Renton spends some time on one of the more interesting aspect of the sisters’ lives: their establishment of, and participation in The Souls. A group of friends who all traveled in the same elite circle, often spending a great deal of time together, formed the eclectic group consisting of Liberals as well as Conservatives. The gang refused “to sacrifice private friendship to public politics.” And yet “Politics was the warp and weft of the Souls’ daily lives . . .” The Souls consisted of both men and women who set their own styles of the day in their clothes, their discussions, and their artistic tastes. Renton spends smaller amounts of time on the brothers, Guy and George, but it is clear that as part of the family, their importance cannot be understated. As with many wealthy, well-placed men of society in Victorian England, the brothers we active in politics. Whereas most women of the day remained away from political activity, such was not the case with the Wyndhams, especially Mary. While women still did not have the vote, that did not stop Mary from participating. Her ongoing relationship with Arthur Balfour, a political icon of the day, provided her with insight into the workings of the British government, and she was not above making her opinions known or giving suggestions. Renton shows a great amount of poignancy throughout the book as she discusses the relationships between friends and within the family. She makes the point clearly how important many relationships were to this family, and how death took it’s emotional toll even after many decades. Those Wild Wyndhams is a beautifully written, thoroughly researched tale of family, friends, and history. It is an easy read, with humor, pathos, and the curious behaviors of its fully three-dimensional characters. A great book for anyone who enjoys reading about days past and the people that made them great!